In order to share all of the amazing volunteer work being done across New Jersey, the Jersey Cares City Spotlight will showcase exceptional civic engagement twice a week in a specific New Jersey community. 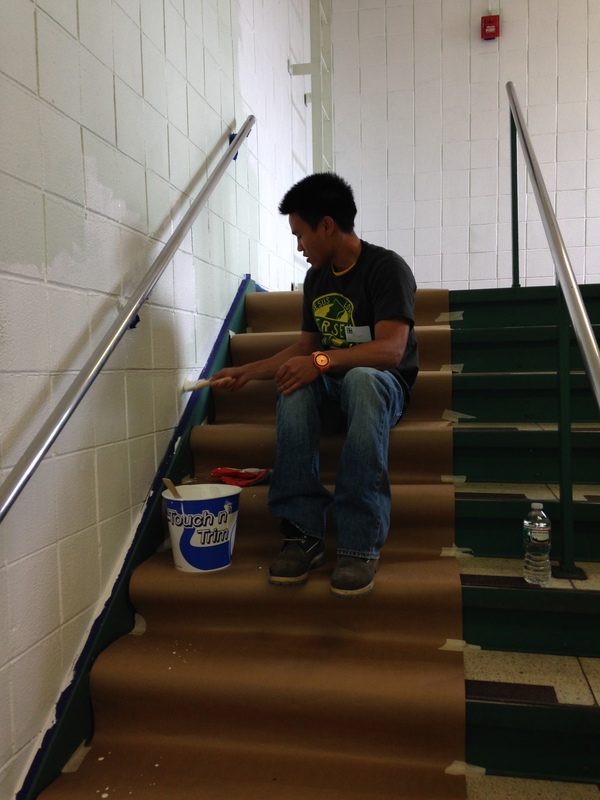 A Jersey Cares volunteer painting the stairwell in Asbury Park Middle School. Did you know Jersey Cares has volunteer opportunities in Asbury Park? Over the past few months, coats were distributed through the Jersey Cares Coat Drive to keep our neighbors warm during this brutal winter. Recently, nearly 100 volunteers spent a fun afternoon bowling with a local community center, built new picnic tables and bookshelves and provided fresh coats of paint at agencies and schools in need. Two different corporate groups and individual volunteers on Sandy Service Day also gave back in the area providing nearly 250 hours of service to the town. If you’d like to get involved in Asbury Park volunteer projects coming up, there will be a Beach Sweep on Saturday, April 26th to get the shore ready for summer. We also need 100 volunteers to paint murals, landscape and plant flowers at a local public school on Jersey Cares Day, Saturday May 3. Join us in continuing our efforts in Asbury Park, NJ!